The United Nations' Sustainable Development Goals (SDG) provide a concrete and concise framework for the international development community to focus its efforts. The goals cover a variety of domains – including poverty, hunger, education and health. SDG 7, “Ensure access to affordable, reliable, sustainable and modern energy,” makes the list of goals because, in our connected and industrial society, clean energy – particularly in the form of electricity – is critical (or at least very helpful) for achieving most of the other sustainable development goals. In many ways the story of the genesis of our paper is rooted in SDG 7 and asking what kinds of electricity grids we can use to achieve this goal, and in particular what is the appropriate geographic scale for the systems that we build to meet SDG 7? Historically, affordability, reliability and sustainability have all benefited from increasing scale. For example, as you increase the size of a coal plant (and the number of customers it serves), the cost per unit of electricity produced tends to decline, much in the same way a mass-produced car is cheaper than a hand-built one. Reliability can improve with geographic scale by unlocking opportunities for redundancy in the transmission and generation assets. And sustainability can improve with geographic scale by accessing low-cost but remote wind or solar resources. There are challenges to accessing the benefits of scale, however. Large grids require stable governance at national and multi-national levels, and if they are to serve everybody, require that the agencies responsible for regulating those grids are accountable and responsive to all their constituents. This has historically been a challenge in regions with large populations without electricity, such as sub-Saharan Africa, where post-colonial national governments do not always operate cohesively with local communities and institutions. Furthermore, accessing the benefits of scale requires paying for a network to connect people and electricity generators together. 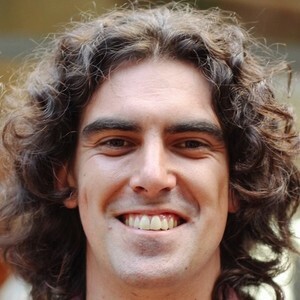 Network costs have historically been easily justified by all the benefits they unlock. However, these benefits haven’t been realized in many regions; in fact, regions like sub-Saharan Africa and South Asia not only have the lowest electrification rates, but the worst grid reliability, and their utilities often require government subsidy to stay afloat. It’s against this backdrop that we started thinking about the incredible historical declines in the cost of solar panels and battery storage. 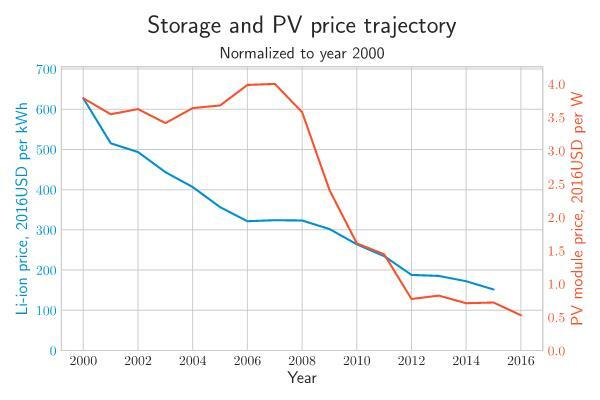 The figure below shows these trends over nearly 20 years for Lithium-ion battery cells and PV modules. The first questions we began to ask were: What if these costs keep falling? Could storage and solar get cheap enough that those traditional arguments to scale no longer produce cost benefits large enough to justify paying for a large grid? If the answer to the question is “yes”, not only would it no longer make sense to focus our research and development efforts on centralized grid expansion, but governments and utilities would need to prepare for a new landscape. We refined our questions to focus on the relationship between the two more quantifiable criteria of SDG 7: affordability and reliability. We focused on the “cost of reliability” for standalone solar-storage systems. For example, if storage and solar prices continue to fall, are there locations where it is financially plausible for off grid electricity consumers to have reliability levels on par with the best in the world, which is in excess of 99.999%? 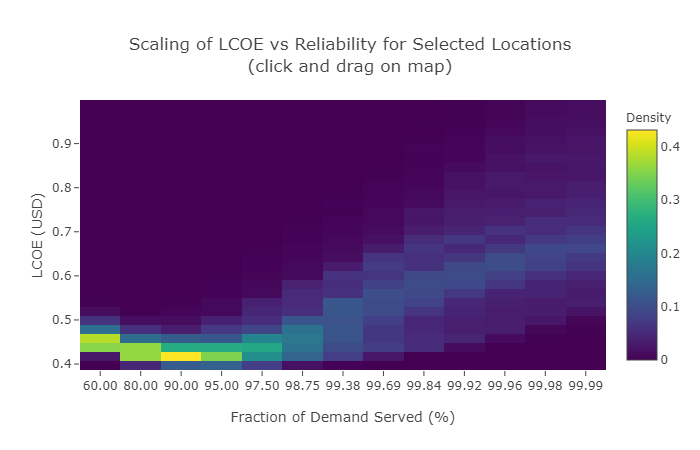 To estimate the ‘cost of reliability’, we had to capture the essence of the system design process for a particular location into a relationship between solar capacity, battery storage capacity, and reliability into an efficient numerical model, which we have published with a visual interface at https://emac.berkeley.edu/reliability for other researchers and industry practitioners to use (see images below for outputs of the model). With the model, we can enter economic assumptions and see how the cost of the system varies with reliability. We found that, given 2017 costs of solar and storage, the cost of electricity increases by $0.11 per kWh for every additional “9” of reliability on average in sub-Saharan Africa. Our results confirmed the general shape of the ‘cost of reliability’ curve identified in a 2014 study that quantified the relationship between cost and reliability in a village in Mali. However, we found smaller cost increases than the Mali study, largely reflecting further cost reductions in solar and batteries. The next logical questions were how will this picture look if further cost reductions are realized? And since decentralized systems can actually provide high reliability without skyrocketing costs, how do they compare with grid electricity prices? We found that the cost per “9” of reliability could be as low as $0.03 per kWh within a decade in an aggressive cost reduction scenario. To put this into context, raising the reliability of service by one 9 would increase operating costs for a small refrigerator—which needs to have high reliability for medical facilities—by under one dollar per month. Furthermore, at these costs, decentralized systems would be less expensive than current grid tariffs in about 1/3 of the geographic area of sub-Saharan Africa. 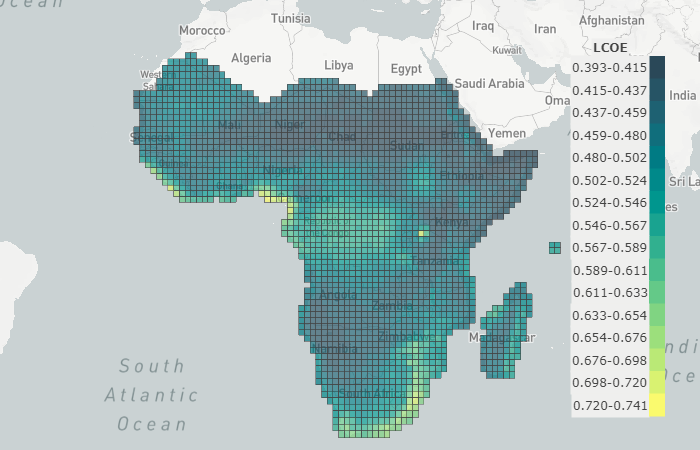 Our results suggest that decentralized solar and battery systems will be increasingly competitive to large grids in sub-Saharan Africa – not just in rural areas or as intermittent supplies, but as a highly reliable alternative. If we put this result in the context of current utility conditions in sub-Saharan Africa – poor reliability and, in some places at least, rising costs – our results signal that the existing utility business model could face a serious threat from decentralized systems. Though we have shown that the cost of reliability (currently $0.11 / kWh per “9” on average) is not astronomical, there is still a price to pay for greater reliability. Historically, ‘the grid’ in more developed parts of the world has been engineered to achieve close to 100% reliability, but should 100% reliability should be the target for new infrastructure in places without electricity? The right reliability will depend on what the power is being used for, and how flexible electricity demand is. We expect additional dimensions of reliability, like the predictability, frequency, duration and geographic extent of power outages to be important to varying degrees in different contexts. Understanding these nuanced relationships will require a mix of social scientific and economic methods and would greatly improve the effectiveness of decision support tools for electric power system design. An important feature of decentralized systems is that different installations can be designed for different reliability, so we don’t have to answer what is the right reliability for society, but rather what is the reliability for each application. Our continuing work seeks to better understand the influence of scale on the affordability and sustainability of electricity systems, looking in more depth from the perspective of electricity users and how different kinds of electricity use affect the question.